So remember yesterday’s post? The analogy of how getting a book published is a little like having a baby? Well, sometimes deliveries come sooner than you expect. Like my twins. I had a scheduled Cesarian for a Saturday. So naturally I went into labor Thursday night and the twins entered the world on a Friday morning. That meant that all the stuff I was planning to do on Friday—wash the laundry, water the houseplants, watch my husband install two car seats, take a picture of my very large 38-weeks-plus-a-few-days-pregnant-with-twins self—never happened. A few of our houseplants perished soon after the twins came along, but I think I made the right choice when I decided to take care of the babies and ignore the ivy. Today I got another earlier-than-expected delivery: my box of comp books from the publisher. It’s a very exciting day at my house. Watch out, houseplants. You’ve just been delegated to low-priority, again. My book, in the paperback and book-on-cd forms. ← Q&A: When will your book be out? I’m so excited for you!!!! Good things come to those who wait. Congratulations!!! Oh! This is good news! Very exciting! Thanks Delrae. 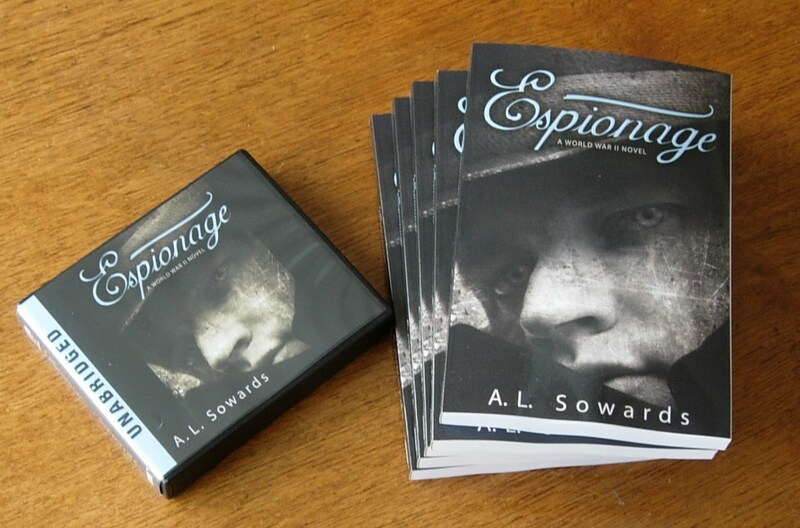 We’re very happy to have a copy of Espionage on our bookshelf!